There have been some serious trouble going on between Apple’s internal system errors with the Login Service. The iTunes connect seems to have an internal error and refuses to login. The iBook Store is not responding as well and there are numerous outages when viewing a separate individual item on both platforms, Mac and iOS App Stores. Other reports from TNW say that, System Developer who use TestFlight to give beta authorization to apps is also not accessible for many users. The system page of Apple does not seem to show this issue at the time being but waits until to report outages which makes it pointless essentially. 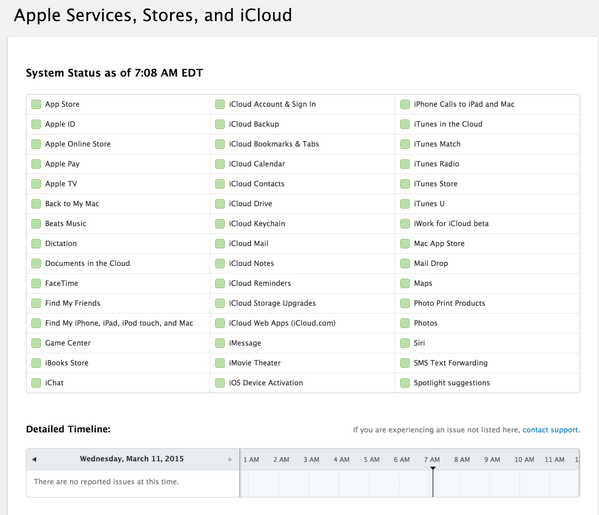 Update 2: Apple’s Status Page has been updated although it shows Yellow for the iTunes alone, however other login services are still unavailable. Some of the issue have been pinpointed saying that iTunes users are affected while on the other hand iCloud logins have caused trouble but the vulnerabilities are fixed. Update 3: IBTimes UK have been notified by one of Apple’s executives that no comment is yet issued by Apple on this matter while iTunes have been removed from the page of Apple’s System Status. Even though some users have also claimed Apple TV to be affected as well since there have been quite frustrations with browsing when iTunes crashed globally. There have been many reports from all over the world like, South Africa, Bolivia, Brazil Egypt, Japan, Denmark and many other nations, about outages regarding numerous Apple services. We hope Apple fix the problem soon as it redirected its developers with a deadline to end the dilemma by 2PM (GMT). For more on this, do visit us and tell your remarks in the comments.